The latest and greatest tank from eLeaf, the eLeaf Lemo 3 RTA is flexible sub-ohm tank system that incorporates a wide range of pre-built atomizer heads (0.3 ohm EC, 0.25 ohm Ni200 and 0.85 ohm Clapton), along with an easy-to-use 2-post RBA build deck. It has 4ml of capacity, is easily refilled from the top and includes adjustable airflow on the base that directs airflow straight to the coil. 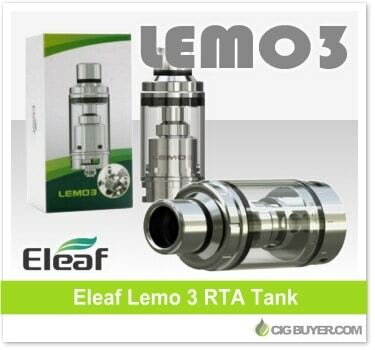 Plus, the Lemo 3 Tank can be fully disassembled for cleaning and maintenance.